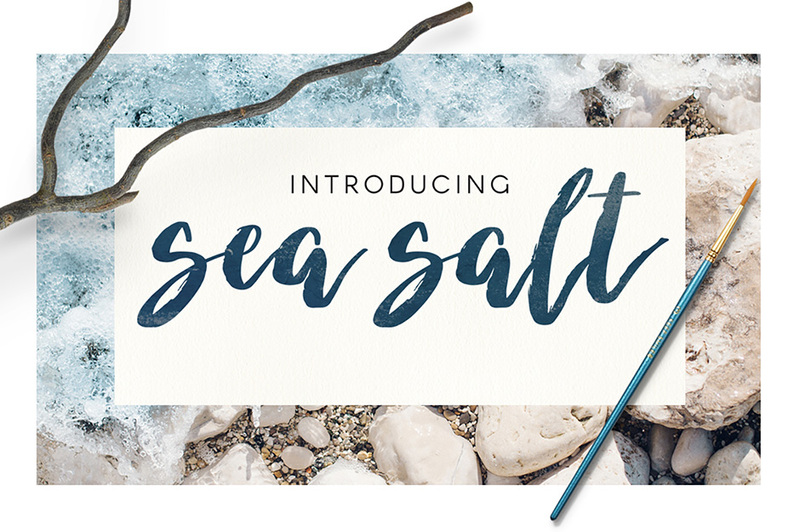 Introducing “Sea Salt”, a fun and free-spirited hand-drawn script. With a wild dancing baseline, Sea Salt adds whimsy and emotion to any project. Perfect for invitations, trendy apparel, branding and typography posters! Language Support: Afrikaans, Basque, Breton, Catalan (without the l-dot, added in Adobe Latin 3), Danish, Dutch, English, Finnish, French, Gaelic, German, Icelandic, Indonesian, Irish, Italian, Norwegian, Portuguese, Sami, Spanish, Swahili, Swedish, Turkish, and Windows Baltic. File size is approx 127KB unzipped, offered as a single download. Looks elegant…and I’ve missed it…any chance to get it again? Thank you so much for your comment. I’m really sorry but I’m afraid this font is no longer available as part of Freebie Friday. Our Freebie Fridays are only available for a 48 hour period as a sort of weekly Flash Sale for our community members I am afraid. This was made available on Friday 13th over the weekend and I’m afraid this expired on Sunday 15th at midnight. I hope this helps, Laura, and please don’t hesitate to contact me should you have any other questions. I’m here to help! Such a beautiful font, thank you! Thanks again, and if you have any quesitons or queries, please do let me know. I’m here to help! I can’t find my file anywhere in my account that I had issues with downloading. I’m so sad! Thanks for your comment. I’m really sorry to hear that you are having an issue accessing your resources. I have sent you an email to get some more information form you and help get you up and running again! Apologies again for any inconvenience, Klaus, but if you have any other questions or if there is ever anything I could assist you with please do let me know. I’m always happy to help! Thank you so much for your comment. You are very welcome 🙂 We hope you love working with Sea Salt! TY mucho for fixing DL! I thought I’d never need another font but then saw Sea Salt. Simply gorgeous! Thank you so much for your kind words 🙂 I’m so pleased to hear that everything is now running smoothly for you and we hope you love working with your new font! If there is ever anything else I could assist you with please do get in touch. I’m always happy to help! I am so sorry for the problem you were having- this has been fixed now and I have sent you over an email about this! Fab font! Just the right amount of “weathering.” But I can’t DL it as a freebie, even though it says offer good until Sun. 1/15 midnight. Thank you for letting us know about this! This has all been rectified now so you should be good to go with your freebie but please do let me know if you have any other queries and I will happily assist you! Thank you so much for your comment 🙂 you are very welcome! We’re so pleased we could share this font with you and we hope you get loads of usage out of it! Thanks again, Ulrike, and if there is ever anything I could assist you with please do get in touch. I’m always happy to help! So beautiful! As always, thanks so much for sharing. Thank you so much for this beautiful font! I can’t want to try it out in an art piece! Thank you so much for your lovely comment 🙂 We’re so pleased you are loving this font and we hope it makes a fantastic addition to your creative toolkit! Très gentil et très joli. Merci encore. We hope you love working with your new font! Very nice font. Thanks for this week’s freebie! Thank you so much for your kind words! We’re so pleased you are loving this week’s freebie and we hope you get loads of usage out of it! Thanks again, and if you ever have any questions or queries please do get in touch. I’m always happy to help! Thank you so very much for the Awesome Sea Salt Script! Thanks for the comment, Trina 🙂 Hope you’re loving it! Thank you for your amazing feedback 🙂 It really means the world to me and the team to know that you are loving your freebie! We hope you have loads of fun working with it! Such a lovely comment, thanks and enjoy the font! I am blown away by the beauty of the Sea Salt Brush Script. Thank you so much! Hey, thank you guys. Awesome as always. Thank you so much! It really means the world to have your support 🙂 We hope you love working with your new freebie! Thank you so much for your incredibly kind words! We hope you enjoy this font and get loads of usage out of it 🙂 if you ever have any queries, please do let me know. I’m always happy to help! hope you’re loving the new font 🙂 Happy Designing! Thank you! LOVE you guys. Thanks for the freebie. Thank you so much 🙂 We really appreciate you taking the time to comment and we hope you have loads of fun working with your new freebie! You are very welcome 🙂 We hope you enjoy working with your new font! Thank you so much! This is an amazing gift!! enjoy, and thanks for the sweet comment! Thank you so much for your comment! In order to download this font, you will need to be logged on to your account page at http://www.designcuts.com/login. Once you are logged in, you should see the the name of your bundle and the link to ‘View Files’ which should let you download your font from there! I hope this helps, Martha, and please don’t hesitate to contact me should you have any other questions. I’m here to help! You are very welcome V! We hope you love working with it and get loads of use out of it :). You are more than welcome and thank you for taking the time to comment- we really appreciate your support! Enjoy the freebie Asya, and have a great weekend! You are very welcome and we hope you love working with it 🙂 We would love to see anything that you create with Sea Salt if you are keen to share! @Jenifer, it’s a pleasure, enjoy! Thanks for sharing such a gorgeous DBD font. Hope you’re loving Sea Salt, Diane 🙂 Happy to share my products with lovely customers such as yourself! Joli typo ! Merci ! Merci Beaucoup Patrick for your lovely comment! You are very welcome and we are so pleased to hear you like this one :). De Rien Patrick! (Did I say that right?) Enjoy Sea Salt typeface! Beautiful font! Thanks for sharing. You are welcome and we totally agree with you- this is a beautiful font :). Hopefully you will get lots of use out of it! Thanks for the comment and we are so pleased that you are happy with your freebie! Please do let us know if there are any fonts that you would love for us to feature that have the support you require and we can try and get them for you :). We hope you had an awesome weekend Thomas and got loads of use out of Sea Salt :). have a great weekend and I hope you enjoy the font! So awesome! Thank you so much, my DC Superheroes and DrawBabyDraw! You are very welcome and we are delighted to hear you love your freebie! Thanks Liv, so glad you like it!